Eleven prong set oval cabochon cut natural tanzanites approximate total weight of 97.79ct., clarity is heavily included, type I, medium dark, very slightly grayish, violetish blue color, (GIA vB 6/3), cut is good. Transmitting light with a minimum of distortion, transparent. Naturally occurring internal & external characteristics are present. Color grade is an average for the group. Graded in the setting. 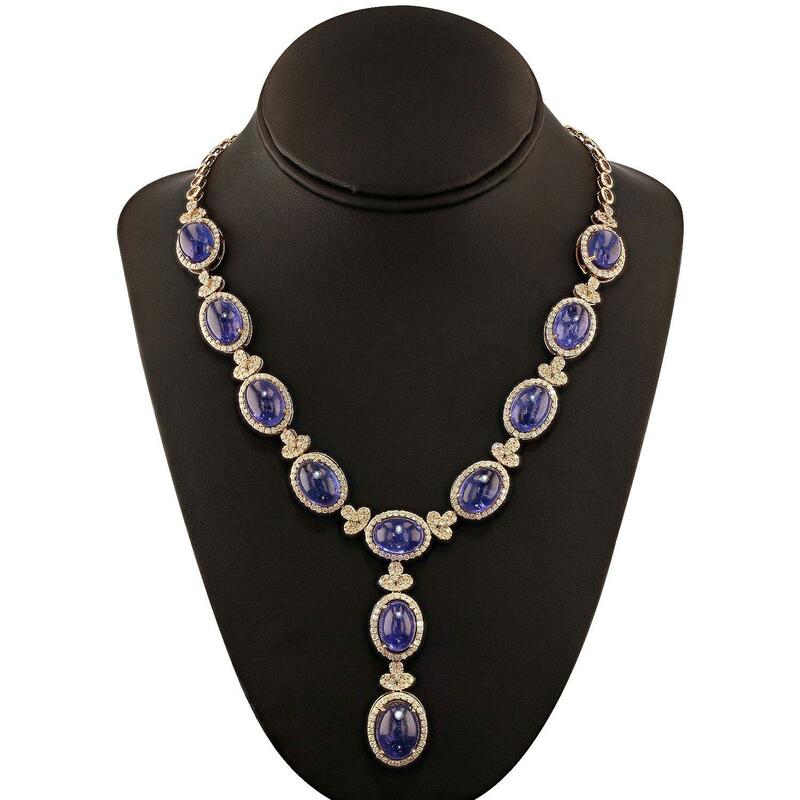 Tanzanite is a very rare gemstone that is only found in the country of Tanzania. Originally discovered in 1967. Tiffany & Company, named the stone Tanzanite. It is found in the Usumburu Mountains that border the Umba Valley of northern Tanzania. Tanzanite occurs in gray, brown, violet, blue, reddish-purple, & green. The gem is interesting because of its exceptional pleochroism. Rotated in different directions a tanzanite will exhibit multiple changes of color. Tanzanite has a low tolerance to ultrasonic cleaning, and should not be cleaned using this method. Four hundred sixty-eight prong set round brilliant cut diamonds approximate total weight of 46S Stoncl; C.53c,L Color grade is an average for the group. Graded in the setting. Total Weight of Colored Stones 97.79ct. Total Weight of Diamonds 6.55ct.